Have you ever seen a live band move you so much that you want to get them permanently inked on your body? No? Well maybe you should see the Jar Family. You’ve read their review on here before, right? Well this one, THIS GIG, meant a lot more to me than the Coffee House Sessions. I hate coffee. I was lucky enough to catch the band at their one off gig at Redcar Blues Club (The Priory), and I mean lucky. I only got told I could go in five minutes before the gig was due (shout out to my brother for giving me a lift down), from Dali, after Richie had tried to get me in. I was ecstatic – a boring Saturday night alone turned into one of the greatest nights of my life. If you follow the website, and the previous blog, you will know that I have been to many gigs in my time – and very lucky enough to see some amazing bands. And after tonight, I realise, that all those positive gig reviews I did I wish I had saved all those positive metaphors and adverbs so I could explain to you what I experienced tonight with the Jar Family. Talking to Richie (the top hat) outside, I mentioned that I base bands from the atmosphere, the top being what I saw at Dublin, the bottom being a Paul Weller gig I had been to. I was to humbled and embarrassed to admit that the Jar Family are the best band I’ve ever seen live. Despite being lucky enough to see the Who, Stone Roses, Noel Gallagher, and a large list of great musicians, I can hand on heart say the Jar Family have everything that I have ever been looking for. They’re fun, but without being too gimmicky and cheesy, each and every member has an amazing talent that is indescribable – and they are incredibly humbled whenever a fan comes along and tells them how great they are. 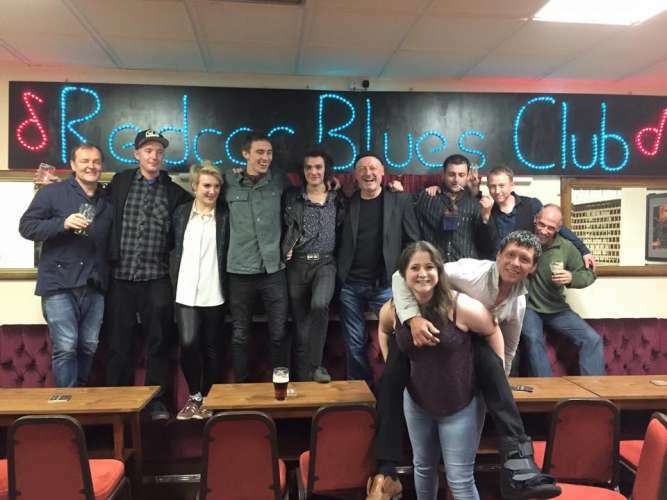 I managed to catch the whole band this time, Kez, Keith, Richie, Dali, Maxi, and Chris, at Redcar Blues Club on Saturday 9th of May. And I remember seeing just Richie, Maxi, Dali, and Chris at Teesside University, and thinking that it couldn’t get any better – but it did. You see, Maxi has a voice that is indescribable, I think I described it before as Bob Dylan being able to sing in tune, but it’s so much more than that. Entwined with his guitar and mouth organ, Maxi has an unwavering talent, one that can only be appreciated once seen in the flesh – a beautiful soul and so much carried on his voice for someone who is only 22. I haven’t done this for a while have I? Describing each band member, and I also haven’t done a gig review straight after a gig since…. well, I don’t think I ever have. For the first time I could catch Kez and Keith, and I was lucky enough to be in the presence of two amazing musicians (remember Squeeze? Keith was their bass player… oh yeah). I was so glad I managed to catch the full Jar Family experience with Kez and Keith in tow, because they are that extra bit. That extra piece of cake, that extra drink at the end of the night – the beauty, and that final piece that gives you strange tummy feelings when you see the Jar Family. And Richie, Richie Docherty, Richie the Top Hat, Richie Rich – as I like to call him as of two seconds ago. He has a unique voice, as does each member of the band, but Richie’s, it literally comes from the soul – and you can feel it too. As well as being the craziest bongo player I’ve ever seen, and being a dab hand at tambourine, Richie is a fantastic guitarist, as well as a vocalist. Dali – I like to think he sounds like Tim Healy when he talks, but he is also the sweetest vocalist and meanest guitar player. If you have ever wanted to see an amazing frontman up and close then look no further than Dali. He is your comedian, frontman, and inexplicably talent musician all rolled into one. Finally we come the the lovely Chris, a man who feels like he underestimates himself, and is modest about the ability he holds in his hands. Chris is the electricity behind the Jar Family, quite literally – and bringing the band together with the rhythmic connection to music he quite obvious adores. So what else can I say about the Jar Family? Well once you you have seen performers like Pete Townshend and Johnny Marr and you can safely say that the Jar Family are the best band you’ve seen live – then I’m not sure what else I can say to sell them to you.